Bell Stoker Mountain Bike Helmet is a very tough looking and durable helmet with the proper blend of style and rigidity. The shell is made from a micro-shell using the in-mold technology, and it features an adjustment strap. It comes with air vents that are well channelled on the inside and an extended coverage for the rear part of the head. This combination keeps your head cool and you can now ride confidently when going through rough terrain. 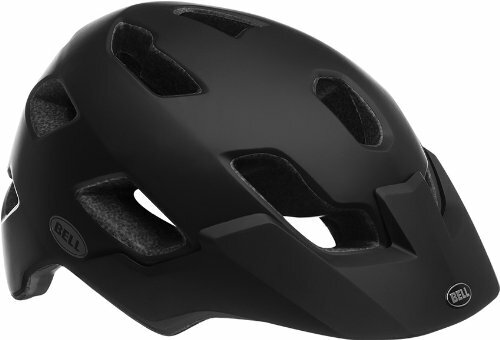 This helmet incorporates other awesome features such as the SpeedDial fitting system which allows you to properly fit the helmet according to the shape and size of your head, and adjustable visor to protect your eyes from dusts and sunglare, making a perfect system that works well for any type of riding adventure. Utilizes an in-mold technology for the construction and this bonds the shell to a foam liner made from polystyrene that is expanded for high performance with low weight. Comes aith air vents that has channelling on the inside strategically located to utilize the incoming airstream for effective cooling as well as an exit system for the used warm air via ports located at the rear. Features an easy to adjust system operated by a Speed Dial fitment with a simple twist for getting the perfect fit for any particular head size. Comes with straps that are operated with a cam-lock and easy to operate to allow for a tight and comfortable fit. Superior padding achieved with the coolmax system which enhances evaporation of sweat from the head by absorbing the sweats so the biker can experience a cooler feel. An adjustable sun visor, compatible with goggles, is included for added protection to the eyes. The Bell Stoker Mountain Bike Helmet is made from high quality material and looks sturdy. It is well ventilated to allow for decent cooling when riding on hot days, the padding on the inside provide adequate protection and it doesn’t make your head feel very heavy. The nice feature about this helmet is the superb speed dial system made make for easy adjustment. It allows you to get the proper fitting size for your head by simply twisting the adjustment knob with one hand even when you are on the go. This helmet will give you all the basic protective features for your head and the visors will help protect your eyes. For the price, its a good buy.